We recently reviewed the ten most tipped stocks, which are leading the market by 17% so far this year. However, there was a second crop, the ‘ten more’ most tipped stocks (i.e. in positions 11-20)… So, how is this group tracking so far? This list included Jumbo Interactive and Nearmap, which have both more than doubled already, and as a group, the list has gained a remarkable 30.6% YTD (Vs the ASX +10.6%). So, with a lead on the market of 20%, they are even outperforming the first group. The Powered by Jumbo platform offers a suite of products that can be utilised by the operators of lotteries businesses. Given the expected commencement and ramp-up of the Mater Foundation software license agreement, and expectations of additional contracts, we have increased our earnings estimates from this new division. Given the Software as a Service (SaaS) nature of this business, it is highly scalable and profitable and we estimate EBITDA margins of approximately 80% rising to approximately 90% over the next few years. It is early days for Powered by Jumbo but this product has the potential to contribute material earnings over the years ahead if successfully rolled out. We have made minor changes to FY19 forecasts (NPAT +3.2%), while our FY20/21 forecasts have increased significantly more due to expected continued growth in digital sales and the contribution from the Set-for-Life game. Our revenue forecasts have risen 20% in FY20 (A$80.7m) and 27% in FY21 (A$95.9m), while EBITDA now sits at A$52.1m in FY20 (up 27%) and A$64.5m in FY21 (up 36%). As a reminder, JIN has grown TTV at a 5-year CAGR of 10.9%. 1. Given JIN's strong cash position we expect a special dividend to be declared and paid before 30 June 2019. Nearmap (+104.1%): After a steep climb, time to cruise at altitude? Nearmap has had a remarkable trajectory, doubling in the first quarter of this year, becoming a billion-dollar stock on the way. Over three years, the stock is now up 10-fold. It has been popular with fund managers writing on Livewire over this period, and you can follow the timeline by clicking here and scrolling down. If the stock is new to you, Mason Willoughby-Thomas provided a good overview of the investment thesis in this wire following the company’s impressive February results. 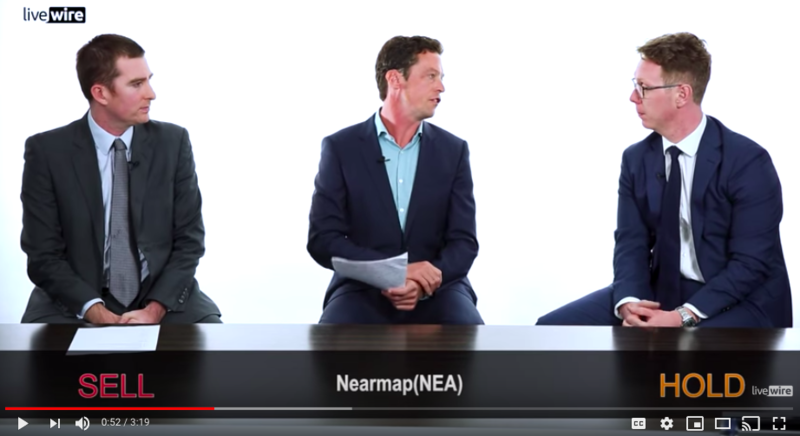 When the stock was discussed most recently, on Buy Hold Sell, our panelists, Martin Hickson from Wilson Asset Management and David Keelan from Ellerston Capital were less positive on the stock, both citing valuation concerns. For us, it's a sell. They've done a great job moving into the U.S. and expanding there, also growing their share in Australia. However, we think that the valuation more than reflects that. It's on a P/E of more than 60 times on FY21 numbers. So, very expensive. For us it's a sell. We're on a hold, and we agree management have done well, the story's been one that's been, it’s taken its time to get there but it has got there. But the multiple is priced in a lot. "While the domestic economy continues to face a myriad of growth hurdles near term, Australian businesses with established channels into higher growth offshore markets (particularly the US and Asia) have been amply rewarded for their investment in overseas expansion. An Australian dollar now plumbing multi-month lows (sitting at c. US71c at the time of writing) provides an additional near-term attraction given the currency translation benefit of the AUD/USD retreating a further -4.8% over the first half of the financial year. …Infection prevention medical device company Nanosonics (NAN) announced a further +9% increase in the global installed base of their infection prevention device ‘trophon’, including Europe, Asia, Australia and North America". It was notable that there were three gold producers out of ten stocks on this list. As the smaller, emerging name, Aurelia has led the pack, while the larger more established producers, Northern Star and Evolution, which have done fantastically well over the long term, have risen less. While there has been no specific commentary on these stocks this year, Rob Tucker at Chester included all three in a comp table he provided in a wire making the case for Gold Road, which has itself been on a tear this year. Some gold exposure, whether it is as an outright view, or even just as portfolio insurance, doesn’t seem like the worse idea right now. The best thesis is a simple thesis, and the Fed’s backflip may be reason enough to own some. David Coates at Bell Potter laid out the case for gold in more detail at the start of the year in his wire reviewing the sector. 1. Diversification and portfolio protection in the face of high equity market valuations and gold’s role as an inversely correlated asset class and long-term store of value. This negative correlation strengthened as global equity markets fell from their September 2018 highs. 3. A more dovish outlook from the US Federal Reserve in December, with the outlook for interest rate hikes for 2019 and 2020 lowered vs expectations earlier in 2018, following commentary that policy settings were approaching a neutral level and the implication that the end of the monetary policy tightening cycle is closer. “Firstly, in the short-term, the devastating tailings dam failures in Brazil have put a rocket under the iron ore price, which was marginal for MIN in the first half. If we roll through spot pricing for the remainder of this financial year, we could see the iron ore division generate EBITDA of $100m - $150m – a substantial upgrade. In the short term, we are also likely to see a rebound in the Mining Services division, with MIN management highlighting an additional 35mtpa they are tendering for. Secondly, the market seems to have forgotten that MIN has signed an unconditional agreement to sell half of just one of its assets – Wodgina – to one of the world’s largest Lithium producers Albemarle for US $1.15bn ($AUD1.6bn). Whilst the timing of receipt of funds is uncertain, these proceeds will completely expunge MIN’s entire debt and leave it with a war chest of ~$500m. Thirdly, the market seems to be undervaluing the significant cash flow and earnings that will accrue from the imminent commencement of production of spodumene at Wodgina. On a steady state basis, we believe that this can be in the order of $150m-$200m per annum for 30+ years. And finally, over the longer term, MIN is developing a lucrative lithium hydroxide operation and has a pipeline of mining and technology assets. Whilst it often flies under the radar, MIN has been one of the true success stories over the past decade. Since listing in July 2006, MIN has grown EBITDA from $38m to $575m in the 2018 FY. During the first half of 2019, the foundation has been laid for the next stage of growth. Baby Bunting presents a rare opportunity to own a retailer that is growing sales and expanding margins. An unprecedented level of market consolidation in the Australian baby retail sector is allowing Baby Bunting to grow sales and profitability materially in a short space of time. Over the next few years, we expect Baby Bunting’s earnings to double as it continues to benefit from market consolidation, revenue growth and improving scale benefits. 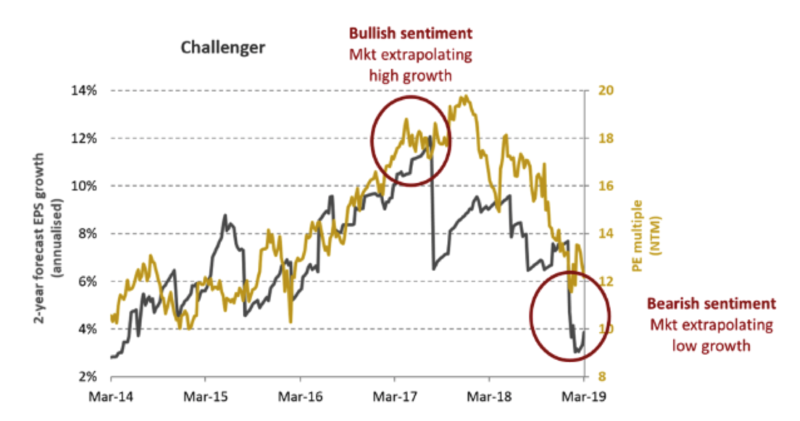 "Challenger (CGF) is another example of the market extrapolating short term issues. About two years ago, the company was priced for perfection trading at 18x PE multiple. At the time, there were no short-term issues and a high valuation multiple was justified by the burgeoning cohort of retirees buying CGF’s annuity products. After its recent earnings downgrade in late January 2019, the stock collapsed more than 20%. The consensus earnings growth rate was revised down substantially, and the company is currently trading at 13x PE multiple. What happened to the bullish narrative on annuity sales? Last but not least, AMP. This was always a particularly interesting inclusion to this list as a big cap that had fallen dramatically. While we have no recent commentary on the stock, we have just recorded an interview with one of our partnering managers and looked at this stock in the course of the discussion. So, if your inner contrarian has an interest in this one, look out for that in the coming weeks! If you missed it, we also recently reviewed the ten most tipped stocks from our Livewire reader survey. This diverse basket was already up by 25.6% on average (or 26.9% with dividends), versus 8.6% for the ASX200. Read on for exclusive insights on each stock from David Poppenbeek, Joe Magyer, James Abela, Dave Allingham, Charlie Aitken, Suhas Nayak, Catherine Allfrey, Warryn Robertson and Emma Goodsell. If you've found this piece useful, please like, follow, comment or share it with investing friends. Thank you for your support, and all the best for a prosperous investing journey through the rest of the year. Great article! Also, well done assessing small and medium cap equities. I think a wire looking at the ten or twenty most tipped small and/or micro cap stocks would be interesting.